'Against anti-Semitism in any form' Jump to media player Labour leader, Jeremy Corbyn, has said his party and the trade union movement stand "absolutely against anti-Semitism in any form". 'Smear against ordinary party members' Jump to media player The Labour shadow cabinet minister, Diane Abbott, has said it is a "smear against ordinary party members" to suggest "that the Labour Party has a problem with anti-Semitism." Election 2016: What can Labour expect? Jump to media player Jeremy Corbyn will get his first big electoral test in just under two weeks time when voters go to the polls in local elections on May 5th. 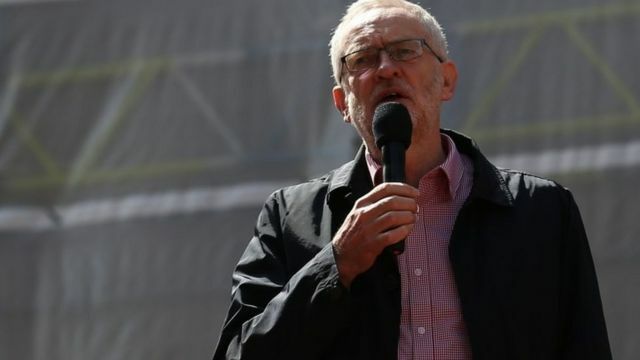 Jeremy Corbyn: No crisis in Labour Jump to media player Labour leader Jeremy Corbyn tells the BBC there is "no crisis" in the Labour Party amid a row over anti-Semitism. Labour leader, Jeremy Corbyn, has said his party and the trade union movement stand "absolutely against anti-Semitism in any form". He made the comments while addressing a crowd gathered in London for the annual May Day rally.